How about a baseball story that does not center on the World Series? Nine locally-based military charities shared $24,000 in grants awarded by the OceanFirst Foundation as part of their Home Run for Heroes Program, which was a joint effort of the bank’s foundation and the Lakewood BlueClaws. Each home run hit by a BlueClaws player at FirstEnergy Park this past season saw $1000 donated to a military-based charity that meets the emergency needs of local service men and women and their families whether they are active or retired. This year alone OceanFirst Foundation has contributed more than $1 million to community programs. The Ocean County College Sailing Team continues to have tremendous success on the water. The Vikings won the Nittany Lion Open last weekend with Cornell placing second and the host school Penn State coming in third. Tyler Kennedy of Pine Beach and Lanoka Harbor’s Autumn Hoover finished first in the A division for the third straight regatta. This weekend OCC heads to St. Mary’s College in Maryland to compete in the Middle Atlantic Intercollegiate Sailing Association championships. Jackson will now face top-seed Red Bank Catholic on Saturday in Neptune in a meeting of the last two Shore Conference champions. Calling Jack Lamping “Mr. Ocean County” gives you an idea of the high regard he was held in. An articulate multi-talented renaissance man, he is best known for his long tenure as Ocean County’s Public Information Officer and for the time and effort he gave to many civic organizations. A lover of the arts, music and history, Jack passed away last weekend at age 94. A memorial service will be held on November 11th at First United Methodist Church of Toms River. showdown between the New York Yankees and Philadelphia Phillies pits baseball’s best two teams against one another. The Yankees of course are rich in history and tradition even if they have moved into a new Bronx ballpark in which the simple name remains the same….Yankee Stadium. Gone to some extent might be the ghosts of Ruth, Gehrig, DiMaggio and Mantle but the monuments still exist as do their signature pinstripe uniforms. This is the 40th World Series appearance for them, having won their 26th and last title in 2000 followed by disappointing losses in 2001 and 2003. They are a mixture of old Yanks in Derek Jeter and Mariano Rivera and new players like Mark Teixeira and CC Sabathia. Then there is Alex Rodriguez who has gone from goat to hero and is poised to win his first championship. The Phillies have reached baseball’s Promised Land for the second straight October and 7th time overall. They dispatched Tampa Bay in five games last year to win the World Series championship for just the second time in franchise history and first since 1980. Much of their tradition centers on failure and disappointment with the exception of stretches in the late 70’s and early 80’s but that was before this current group was assembled. Chase Utley, Jimmy Rollins and Ryan Howard have fueled a renaissance and turned around the image on an entire city. The Phillies never-say-die attitude has won over old and new fans and made the color red very popular in the city and region. So who will prevail in this showdown of teams whose ballparks are just over 100 miles apart and two hours away? Well I think it comes down to the fact that the Yankees are probably just a bit better in most areas so I think they’ll prevail in 7 tough games. Should be a lot of fun, especially for those who dislike both teams because somebody will be disappointed at the end. When someone you know dies you often reach out to a family member with the following words “if there is anything I can do please don’t hesitate to ask.” Of course rarely is there anything you can do except offer comfort and support. However I have this unique opportunity to sometimes tell you about a person who has passed away and I’ll admit it makes me feel better because usually you feel helpless at times of great sorrow. annual banquet hosted by the Shore Chapter of IAABO, which is the association for basketball referees. Frankly I didn’t really want to do it but felt an obligation as the year prior they had honored me with an award because of the relationship I’ve built up with them through the WOBM Christmas Classic. I also didn’t want to turn down Art because his son Matt has been my broadcasting partner along with Ed Sarluca on hundreds of games and events over the years on the Shore Sports Network. So I accepted the invitation to MC the dinner and banquet and frankly had a great time busting Art and others…of course most of it was in good fun. During the evening Art was among those saluted for their service as a 40-year member of IABBO. I of course knew him even before Matt and I began working together as both he and his brother Rick had referred games in the WOBM Classic for many years. who always appeared to be in great health suffered a massive stroke. While he fought to hang on Matt continued to broadcast games, paying tribute to his father during our high school game Friday and the Monmouth University game on Saturday. The radio was on in the hospital room and Matt was hoping against hope that his father could hear his voice and words one more time. Sunday Art Harmon, retired teacher and coach, lifeguard for more than four decades, ski instructor, father to Matt and Tim, brother, husband and grandfather died at the age of 63. Viewing will be Thursday from 2-9pm at O’Brien Funeral Home in Wall. A life well lived if too short. The nightmare has indeed come true with the Yankees and Phillies meeting in the World Series beginning Wednesday night in the Bronx. This is something Mets fans have been dreading since mid-summer and now that its here the question is who do we root for. Well in my case it’s who do you root against the most and for me it’s the Yankees. There is no right or wrong, just a matter of personal preference and comes down to simple arithmetic. For every Phillie fan I know there are at least two Yankee fans so for that reason the Phills are the very reluctant pick. Honestly at the end of the day it does not really matter as both teams are a reminder of what the Mets are not. On the subject of baseball I received a tour of the recently-completed Volunteer Community Center at the Berkeley Little League’s Moorage Baseball Complex in Bayville last week. The indoor training complex is already a busy place being used by little league players of all ages during the off-season to work on their baseball skills while league officials can hold training for coaches, meetings, registration and more. The facility was built through years of fundraising and volunteer work by the Little League and in conjunction with Berkeley Township. It’s a tremendous asset to the community and a great example of what can happen when people unite to work together. The Volunteer Community Center has been appropriately named after Bob Everett, the league President who spearheaded the effort and refused to give up despite numerous obstacles along the way. The Beachwood Soccer Club is holding a gift auction on Saturday, November 14th at Toms River Intermediate School South. Tickets for the event are $15 and include coffee and desert. For tickets and more information you can call Dawn Caruso at (732) 473-0915. As you have probably heard Shawn and Sue’s Halloween Spooktacular on Saturday night at the Ritacco Center was a smashing success and I want to thank all of those who attended for their patience. When you do something like this for the first time and don’t know what to expect it’s hard to prepare but most people were very understanding and appreciative as it was a great family event and we’ll make it even better for next time. Special thanks to our partner, the Toms River Regional Schools for being great hosts. It’s funny how certain professions carry a stigma associated with them, much of which is not deserved. Lawyers and police officers may top that list and those who sell cars would not be far behind…they are easy targets and often the brunt of jokes. Of course it’s ridiculous to lump those who work in a certain career into one category but we seem to generalize quite a bit. Some of the most generous and philanthropic individuals in our community make their living from selling cars, including Dave Wintrode from the Causeway Family of Dealerships and David Sickle from the Pine Belt Auto Group. They have both been around for a long time and have been deserving recipients of many honors for giving back to the community. Ed Sunday of Gateway Toyota is another and yesterday he was saluted by the Girl Scouts of the Jersey Shore at their 26th Annual Award Luncheon at Woodlake County Club in Lakewood. I had the pleasure of serving as Master of Ceremonies for the event which was co-chaired by attorney Bob Novy and Jim DeAngelis of the Lakewood BlueClaws. Honors are nothing new to Sunday and Gateway Toyota, who several years ago were singled out as the Organization of the Year by the Toms River-Ocean County Chamber of Commerce. The dealership does much for the community and Ed, who is the Vice President and General Manager is one who shies away from the spotlight. Sitting with his wife Diana yesterday I know he was almost uncomfortable hearing nice things about himself but the fact is the father of two is a terrific person and an asset to Toms River and the entire community. Not bad for a car guy. The Manchester Township community is dealing with the loss of one of its favorite sons as brain cancer claimed the life of Rodney Copeland earlier this week at the young age of 44. Rodney was a three-sport athlete at Manchester High School and spent much of his adult life working for the Monmouth County Sheriff’s Department. Besides his family and friends, sports were his passion and he was the Girls Basketball coach at his alma mater for several years. 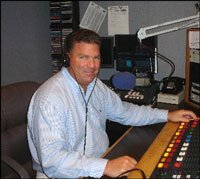 I always enjoyed seeing him at the WOBM Christmas Classic and Rodney was someone who always had a smile on his face and greeted you with a warm handshake. He was one of the good guys and he’s been taken from all of us way too early. Condolences to his family. It is just amazing what nice weather does for your spirits and we’ll have one more day to enjoy this brief stretch which feels more like mid-September then late October. However it would have been better is these sunny 70 plus degree days came over the weekend when more of us could really take advantage of them. Did you ever get hit with a headache which seems like its right over one or both of your eyes? I got one late yesterday, took two Excedrin migraine and got 8 hours sleep for the first time in recent memory and woke up feeling like a million dollars. Well in today’s economy it’s actually more like $92.70. If you’re a fan of sushi rolls I have to recommend the new ones recently introduced at The Office Lounge in Toms River. My daughter and I loved the Cindy, Nick and Halloween rolls. Can’t wait for a return trip. If I were not broadcasting the Howell-Brick Memorial football game tomorrow night then surely I would have returned to my alma mater for a very special evening. Central Regional hosts Freehold and as part of the evening the Golden Eagles will retire the #12 worn by my former teammate Robbie Keyes, who is now a teacher and assistant coach at Freehold. Keyes quarterbacked Central to a perfect 9-0 season in 1971 and earned just about every post-season honor possible. After graduation both he and teammate John Kilmurray attended Florida State University on football scholarships. Robbie was also an outstanding basketball player and track athlete at Central and the number retirement is a fitting tribute of one of the school’s best ever. Wish I could be there but congrats #12. It doesn’t matter if you listen to the radio, watch TV, read a newspaper or log onto your computer because it’s everywhere and you can’t avoid it. The real question for me is do we care or is it simply because we can’t escape it and it’s almost forced down our throats. I’m talking about gossip or entertainment news or call it what you will but it’s like a bad rash…it just won’t go away. What’s amazing to me is not the amount of this so-called news but the fact that often it’s treated like it has great importance in our society. At the same time you have impact stories like the economy and health care and more you’ll find more time and space devoted to things like Dave Lettermen’s sexual escapades. With the exception of a handful of people who could possibly be affected and impacted by Lettermen’s infidelities but yet he got more air time that President Obama for those few days. And it’s not like this is only once-in-a-while because it seems like we’ve become infatuated with lifestyles and the often boorish behavior of celebrities and star athletes and even those who fall into the category of “want to be’s.” But I again come back to the question of whether we really care or just can’t avoid all this garbage and make no mistake about it….this is real trash. The bottom line is most of our lives are fairly routine and maybe even mundane and listening, watching and reading about the famous might be an escape from reality. It just seems like more and more we treat stories about them like its real news. Frankly I don’t care who just entered another rehab program and who was arrested for starting a fight in a nightclub and who just broke up with his girlfriend. I also have no interest in the opinions of celebrities when it comes to politics and national issues. Just do what you allegedly have talent for…whether it’s sing, act or hit a baseball. By the way have you heard the latest? ESPN baseball analyst Steve Phillips had an affair with a 22-year old production assistant who later called the wife of the former Mets General Manager and told her what was going on…kind of like “Fatal Attraction.” Don’t worry you’ll hear about it everywhere before the day is over. Talk about your Blue Monday for local football fans. The Giants were run right out of the Superdome by the Saints in a battle of undefeated teams but its losses by the Jets & Eagles that leave you scratching your head. Hyped rookie quarterback Mark Sanchez threw five interceptions in the Jets overtime loss to the anemic Buffalo Bills while the Eagles somehow failed to score a touchdown in falling to the woeful Raiders in Oakland. Thank goodness for the Yankees & Phillies who appear to be on a World Series collision course. Made my annual trip to Penn State this weekend with my son and brother for a short football weekend. We drove out early Saturday morning in rain, freezing rain and then snow on I-80. The State College area got hit with a rare October storm that brought heavy wet snow mostly on Friday that resulted in power outages and forced officials to prohibit parking on grass areas around Beaver Stadium which would normally accommodate 20,000 cars. What they did was run shuttle busses from nearby areas and it seemed to work…some even moved their tailgates to those lots. The fact our beloved Nittany Lions shutout Minnesota made everything all right. Things did not go quite as well Saturday for Brick’s Garrett Graham, the outstanding senior tight end at the University of Wisconsin. The former Brick Memorial standout suffered a concussion in the first half of the Badgers loss to Iowa. Graham has 29 receptions and 4 touchdowns this season and is among the top tight ends in the nation and expected to be a fairly high pick in the April NFL draft. Wisconsin has a bye this weekend so it’s hoped the former Mustang will be able to play in two weeks against Purdue. Often a great individual performance is overshadowed when a team looses so let me salute Central Regional senior running back Sam Pepe. Pepe ran for 271 yards and 3 touchdowns but it was not enough as the Golden Eagles lost at Jackson Liberty 36-35 in overtime Saturday. In the victory the Lions Matt Filosa rushed for 151 yards and three scores. When you wake up and here the meteorologist on TV say “this is possibly the worst four day stretch of October weather ever in the mid-Atlantic region” then you pretty much know outdoor activities are in jeopardy this weekend. Problem for me is this is Homecoming weekend at Penn State and for weeks I’ve been looking forward to tomorrow afternoon’s football game against the University of Minnesota. As it now stands the forecast for game-day calls for a mixture of rain and snow with a temperature around 34 degrees. It does not get much more miserable than that and what’s even worse is we had plans for hours of tailgating before the game. Of course we could just bail on the trip but that’s not so easy. My son is in State College already and was planning to come back with my brother and me on Sunday. We’ve already paid for the tickets and motel room and refunds are out the window. So what do we do….probably suffer through an awful weekend. What’s even worse….the sun will return on Monday like that will do us any good. The weather figures to play a prominent role in this weekends high school football games and there’s more to it than that….for some its Homecoming weekend. That makes it tough to postpone games because of events like dances and more. Since the entire weekend looks dreadful you might as well just play the game when it’s scheduled because it does not appear there is any relief until Monday. Topping tonight’s matchups will be Southern at Toms River North which will be broadcast on 105.7 The Hawk, 1160 WOBM AM and Fox Sports 1310. After losing their first two games the visiting Rams have won two straight and face a North team that was very impressive in rolling over Brick Memorial last week. Southern and North have become very familiar with one another in recent years from regular season and state playoff meetings. Another interesting game tonight finds Toms River South visiting Brick. while the 2-3 Green Dragons have scored only 17 points in their last four games. I appreciate the fact that people who are not sports fans of any kind don’t like it when I do a segment that is sports-related and at the same time there are those who think I should only stick to sports. I’d like to think this morning’s segment will be of interest to both sides and the basis for it is Phil Taylor’s “Point After” column in this week’s Sports Illustrated. were 131,204 to 1 which is what you would call a real long shot. What makes this even more interesting is Krupin was supposed to attend his 20th and final game of the season on the next-to-last day when the Nats hosted the Mets. However at the last minute he accepted tickets to a U2 concert and skipped the game….need I tell you Washington rallied for a victory. Why I share this story with you has everything to do with why I dislike most fans of the New York Yankees….not personally but rather when it comes to their rooting for their favorite team. This is especially true for those Yankee fans that seem the think that the franchise only started in 1996 when they would win the first of four World Series titles in five years. Real fans are the ones like Stephen Krupin who understand that loving a team usually means you’ll get your heart broken…at least at the end. You don’t expect to win championships, heck in most cases you’d be happy to just win more than you lose. When those great moments come, like the Phillies experienced last year, they are to be treasured as those memories might need to last a lifetime. The Mets, a team I root for and suffer with last won a championship 23 years ago and I remember that 1986 season like it was yesterday. Many (not all) Yankee fans have trouble accepting that they have not won a World Series since 2000 and have not been in one since 2003. They think any season without the ultimate championship is a bad season. That would make Stephen Krupin laugh…he just wants to see a victory in 2010. Wouldn’t you think there would be someway major league baseball could have started the League Championship Series’ before the end of the week? I know the opening round of the playoffs ended early but it just seems a shame we’re not going to start the next round until Thursday & Friday. Would have been nice to have playoff baseball during the week instead of just hockey and pre-season basketball. By the way I would like to go on record….if we have a Yankees-Phillies World Series I will reluctantly root for Philadelphia. Simply the lesser of two evils for this Mets fan. The Toms River-Ocean County Chamber of Commerce will hold a general membership luncheon today at the Lobster Shanty in Toms River. The Toms River Business Improvement District is sponsoring the luncheon and will update chamber members on what’s happening with revitalization plans for the downtown area. Registration begins at 11:30 and the lunch gets underway at noon. Pittsburgh tops The Sporting News’ annual list of America’s best sports cities. The Steel City is home of the current NFL and NHL champions and it’s the first time since the magazine started the rankings in 1993 that Pittsburgh has been number one. Philadelphia is second…Boston, which held the top spot for three of the past five years is third with Chicago and Los Angeles rounding out the top five. New York is #6. West Long Branch, home of Monmouth University was ranked 266th and Lakewood made the list at #354, obviously because of the BlueClaws. I really don’t believe this is a deterioration of my long-term memory or a sign that I’m starting to lose it but rather more a product of too much information. Somebody will ask me about a person who used to work at the radio station and sometimes I will have no or little recollection of them. That’s due to the fact that over 30 years I’ve worked with hundreds of people, some of whom were here just long enough to have a cup of coffee or at least it seems that way. Then there are the athletes and coaches I have covered and worked with over three decades. I may have trouble placing the names with the faces but once I do then there’s a pretty good chance I’ll remember quite a bit about their achievements. Where I can be shaky is when I try to think back as to just when they might have played. I’ll ask about how they are doing in college and find out they graduated several years ago. What really gets me is when I come across someone who it seems played in high school just a few years ago and I learn they are in their late 30’s with kids in school already. There is an upside to these often stark reminders that I’ve been around a long time. That is when I bump into a former athlete who mentions something I might have said or did about them or for them many years earlier. It could have been at their sports banquet, or during a game we were broadcasting or even through the WOBM Christmas Classic. That will make me feel good until I go home and want to share the comment with my wife and forget who the person was. I guess my mind really is shot. While walking in downtown Hoboken on a sunny Sunday afternoon one can’t help but notice the majority of people seem to be in their mid to late 20’s. Outdoor café’s were filled with young people, many accompanied by well behaved dogs on leashes. My wife commented that this is what they call “college after college” and I think that’s very accurate. Yesterday I made my first visit in many years to the city that too many was best known as Frank Sinatra’s hometown. My son just moved into an apartment there with two of his fraternity brothers and I can certainly see the attraction for young people, especially those who work in New York City. Of course what I think he likes most is the fact that Hoboken has more bars per square mile than any other city in the country. While there are exceptions it seems that the one ingredient all successful sports teams share is strong and solid ownership. On the other side of the coin those without it usually fail. Take for example the NFL’s Oakland Raiders who for many years were one of the league’s top franchises. Clearly owner Al Davis has lost it, making decision after decision that leaves you scratching your head. Yesterday’s embarrassing performance against the Giants might have been the low point for the Silver and Black, who are nothing more than a bad joke. The agents of REMAX at Barnegat Bay will hold their 10th annual “Now Famous” Children’s Miracle Network Party this Friday evening at The Captain’s Inn in Forked River. The event features dinner, an open bar, dancing and an auction all to help the Children’s Miracle Network, a non-profit organization that works with more than 170 children’s hospitals to fund medical care, research and education. For ticket information for Friday’s party you can call (609) 693-5002. Belated congratulations to Southern Regional football coach Chuck Donohue Sr. on collecting his 200th career victory Friday night when the Rams rolled over Jackson Memorial. One of the real gentlemen in the coaching business, Donohue is in his 12th season at Southern and 36th overall. and spots in the state playoffs. North is 38-17 over the last five-plus seasons while Memorial is 40-19 over that same span. The two American Division rivals meet tonight in Brick and it’s a crossroads game for both for different reasons. The Mustangs of Memorial are 3-1 with their lone loss a non-conference heartbreaker to Sayreville in the opening weekend of the season. They are a perfect 3-0 in the division with wins over Southern, Freehold Township and Jackson Memorial and a victory tonight would set the stage for a showdown with undefeated Howell in two weeks for the Shore American title. The visiting Mariners were picked by some in the pre-season as the #1 team at the shore and they opened the season with easy wins over Toms River South and Manalapan with a bye in between. Last Saturday night they held explosive Howell to just 7 points but managed only a field goal of their own and lost to the Rebels, who are now the top-ranked team in Ocean and Monmouth counties. Because they’re in the highly competitive South Jersey Group 4 playoff bracket North might have to run the table to earn a post-season spot which means tonight is almost a “win or else” even though its only their fourth game of the season. Tonight’s confrontation features some outstanding senior performers….Vinnie Sabba, Bill Miller and Glenn McGinnis from Memorial and North’s Steve Barroso, Drew Kollman and Rob Cassidy just to name a few. It should be fun and it’s our game of the week on the Shore Sports Network, including 105.7 The Hawk and 1160 WOBM AM. If you are planning to attend the game then be sure and bring at least two non-perishable food items because it will get you free admission. Brick Memorial is running a food drive in conjunction with The Foodbank of Monmouth and Ocean counties. Congratulations to Monsignor Donovan High School Tennis coach Tom Connerton on collecting his 300th career victory as the Griffins beat Bishop Ahr in the NJSIAA Girls Tournament Thursday. Connerton is a former Donovan player and in his 12th season coaching the tennis team. Monmouth University will host a debate tonight among the three candidates for the newly created position of Lt. Governor in New Jersey. I would guess about 1% of us (and I’m not among them) could name all the candidates which is probably about the same number that will watch, listen or care about the debate. The debate can be heard on our sister station New Jersey 101.5. I’ve never had a flu shot because I always felt there was just as good a chance I’d get sick from the shot then the flu itself. However Monday I’m going to get one at the Senior Health and Lifestyle Expo we are hosting at the Ritacco Center. Another admission that I’m not as young as I used to be. I’ve never had less interest in baseball’s post-season then I do this year. Maybe it’s the fear of a Yankees-Phillies World Series which for me is like choosing whether you’d rather freeze or burn to death. By the way Mets officials should take a close look at the Minnesota Twins who manage to be competitive year in and year out despite a small payroll and the fact most of their good players leave for bigger paychecks. It’s not always how much money you spend but where you spend it. “The Good Wife” staring Julianna Margulies is the best of the new TV dramas and I also like “Mercy” and “Flash Forward.” As for comedy relief well “Modern Family” is a laugh out riot. I don’t care who David Letterman sleeps with and neither should you. Public schools should be a positive reflection of their community so it does not say much for those towns that have run down schools. Let me be clear….old and run down are often two different things. Seeing and hearing about young children who are very sick hits me in the gut more than anything else….it just does not seem fair. It’s also a reminder that if your children are healthy then you’ve been blessed. Without question the most significant high school football game going into this weekend finds Toms River North visiting Brick Memorial on Friday night. However it’s not just a big game for the reasons you might expect. Sure both teams are ranked in the top ten at the shore and yes it’s very important as far as the American Division standings are concerned and even the state playoffs. What makes this meeting between these rivals so special is the impact it might have on those who might not know a first down from a field goal. Actually what will take place Friday are two games…one between the Mustangs and the Mariners and the other matches Memorial versus Hunger. Brick Memorial is using this game to conduct a food drive in conjunction with The Foodbank of Monmouth and Ocean Counties and there is something in it for everyone who participates. Officials are asking that everyone coming to the game bring two non-perishable food items because if you do then you’ll get free admission to the game. It doesn’t matter if you’re an adult or student, Memorial or North fan. Bring at least the two items and you’ll watch 48 minutes of high school football on the house. More importantly you’ll have made a difference. By the way we’re broadcasting this game on our Shore Sports Network so I’m looking forward to seeing the results of the food drive in person. And yes I’ll bring my non-perishable items even though I get in for free. Award-winning CBS Sportscaster Jim Nantz received the Monmouth University Award for Communication Excellence last night in a ceremony at the new Multipurpose Activity Center. Nantz, a graduate of Marlboro High School, personifies class and dignity on the air and having met him before I can tell you he is the same way in person. If it’s true that misery loves company then there will probably be a lot of miserable people around the office the next few weeks. At the same time there will be a lot of support going around as we start the 3rd almost annual edition of Millennium Radio’s “Biggest Loser” contest. A total of 14 of us have taken the vow of weight loss and will weigh in today and compete for weekly and grand prizes until November 17th…six weeks from today. While this is an individual competition we added a little twist and teamwork. will be penalized and each of their members will have to pony up an extra $5 per person. Me I lost the inaugural contest by what turned out to be a couple of pounds. I want payback and payout. Jason Allentoff (News) Getting married in March, highly motivated. Annie Smith (Sales) Will use supplements and anything else to win. Heather & Steve Miller (Sales) Husband/wife team has big advantage when it comes to cooking and preparation. Heather did very well in the first contest. Brian Bonder (Sales) Has asked a lot of questions so I think he’s a threat. Sue Moll (Morning Show co-host) Poor history when it comes to this…could be just along for some laughs. Ashly Emerson (Promotions Director) Very close with Sue which spells trouble. They could be closet eaters. JoAnne Cruise (Midday Personality) Nobody can figure out why she is even in the contest except to have material to talk about. I don’t think she has enough weight to lose. Marianne Levy (Co-host Bob & Marianne in the Morning) She has already dropped a lot of weight over the last year and I don’t know how motivated she will be to continue. Michele Degnan-Spang (Sales) She only started working here last week so she is an unknown. The fact that she’s a runner scares me. Lani Torres (Sales Assistant) I am clueless but she is young which is an asset and really wanted to be in the contest. Mike Mangan (Sales) He is a young newlywed who has sort of been flying under the radar. I would not be surprised if he quickly becomes a contender. Undefeated Howell staked its claim as the shore’s top team with a victory at Toms River North in a key American Division contest. The Mariners need to quickly recover as they have a tough test Friday night when they visit Brick Memorial, who outlasted Jackson Memorial in overtime. Toms River East took a giant step towards a Constitution Division title with a rout of Brick. Jackson Liberty scored in the final minute to edge Barnegat and in a game played yesterday, Central crushed Lakewood 52-19 for its first win of the season as Kalyph Hardy and Sam Pepe combined for nearly 500 yards rushing and each scored four touchdowns. As a Mets fan my baseball season ended around the middle of July and frankly I have not paid all that much attention to what used to be America’s National pastime. Thankfully the season ended yesterday for the Mets and most of the other major league teams but for the Yankees, Phillies and others it’s really just beginning. The Yankees will host either Minnesota or Detroit beginning Wednesday as the American League Central champs will be decided in a one-game playoff Tuesday. Meanwhile the reigning World Series champs from Philadelphia will face Colorado in a best-of-five series that starts Wednesday at Citizens Bank Park. There is no better golf outing than the one run by Klee’s Bar & Grill for the benefit of Ocean of Love and the 18th annual is set for Wednesday at Gambler’s Ridge in Cream Ridge. There will be shotgun starts at 7am and 12:30 so it’s a full day for Glenn McCarthy, Joe Carey and the entire crew at Klee’s, who along with the owners volunteer their time and much more. Last year’s event raised more than $40,000 for Ocean of Love. Raise your hand if you knew the hockey season actually started last week? I see a few of you out there. The NHL would be so much better off if they started after the World Series. in those non-stop TV ads. Wow…I can’t count that high. As September turns into October the high school football schedule gives us a weekend of big matchups and when it’s over the picture will be much clearer in several of the divisional races. but first they must get past a Green Dragons team that has been offensively-challenged but found ways to win. Also tonight will be a huge contest in the Federal Division as Middletown South hosts Freehold in a game we’ll broadcast on the Shore Sports Network, including 105.7 The Hawk and 1160 WOBM AM. In starting the season 3-0 Middletown South has allowed just six points and they’ll try and exact some revenge on a Colonials team that has beaten them three straight times, including a state final showdown at Rutgers last December. As expected Manasquan is the favorite to win the Shore National but face an interesting trip south this evening when they head to Pinelands Regional where the Wildcats are off to a 2-0 start with the help of junior running back Matt McLain. The fans will be out in Tuckerton looking for an upset. The most talked about game this weekend will be played Saturday night as Toms River North hosts Howell. Not only are they, along with Brick Memorial considered the upper tier of the American Division but the winner could stake a claim as the top team in the shore. Jimmy Ryan leads Howell’s spread offense which averages nearly 30 passes per game and features a stable of talented receivers. However they will face a defense that’s already returned three interceptions for touchdowns and is led by safety Drew Kollman and linebacker Steve Barosso. Other interesting matchups tonight include Brick Memorial at Jackson Memorial, Jackson Liberty visits Barnegat, Point Boro seeks its first win at home against Raritan and in a battle of winless teams, Southern heads to Freehold Township. For the most part sports comes down to the fact that 50% of the time there is a winner and 50% of the time there is a loser. Despite that intellectual statement much more attention is paid to winners then losers and it’s just a fact of life as unfair as it may seem to be. Regardless if you play high school, college or pro sports the headlines, air time, adulation and hype all surround success…not failure. I say this having gone through it many years ago. When I was a junior our football team at Central Regional High School was something really special. A perfect season with only a couple of games that were even close and comparisons with some of the great teams to ever come out of the shore. Students and fans were three deep at home games, it was the talk of school throughout the fall and just to be a part of it was somewhat magical. Practices were often light and loose and Saturday afternoons always ended with smiles, cheers, pats on the back and that feeling which comes with being a winner. Sunday you got to read all about it in the newspaper. However a year later that was all a distant memory. Graduation had stripped us of all but a couple of top players and from the beginning we knew things would be difficult. Not only that but our legendary head coach had died suddenly and an all-new staff was put in place. Opponents, who we had humbled the year before, circled like sharks in the water and feasted on the opportunity to get their revenge. Losses mounted, the crowds went away, students and teachers found other things to talk about in the hallways and the headlines found us on the wrong end. Those last weeks of the season especially for the seniors were not easy but helped provide a life lesson. That is you play the game because you like the game and if success comes well that makes it all that much better but one person usually cannot determine the outcome….however each can determine their effort. You will also learn a lot more about yourself from sticking with a losing team than riding high with one that wins.